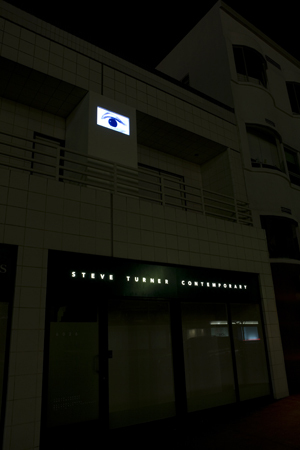 Blind Wall, Installation view, Steve Turner Contemporary, September 2011. Steve Turner Contemporary is pleased to present Blind Wall, a video installation by the Brazilian collaborative team of Botner & Pedro. It will be installed on the balcony of Steve Turner Contemporary, facing Wilshire Boulevard. 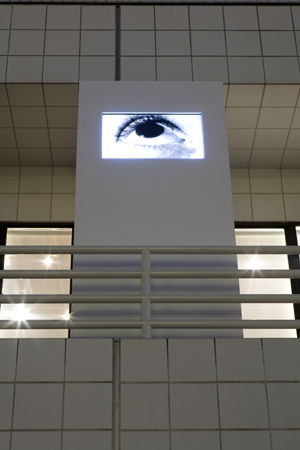 The video shows the slowly moving eye of one of the artists as it continuously watches everything and everyone on the street below. The black and white video refers to avant-garde Russian cinema, and in so doing, it functions as an eye from a different time and place. It also creates a Big Brother type dialogue between the artists and the city below. Blind Wall was previously installed in an exterior wall at the Siqueiros Museum in Mexico City where it faced the street. 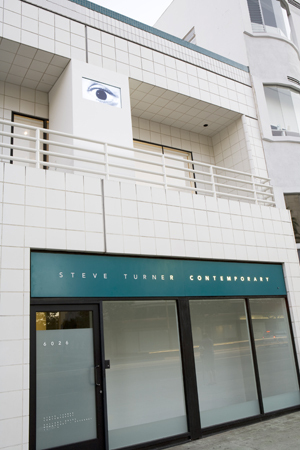 At Steve Turner Contemporary, it will not only face the street below, but it will look across the street to the art institution, to LACMA. Botner & Pedro is a collaborative team consisting of the Marcio Botner and Pedro Agilson. Born in Rio de Janeiro in 1970, Marcio Botner studied at the Parque Lage School of Visual Arts, Rio de Janeiro, (1994). 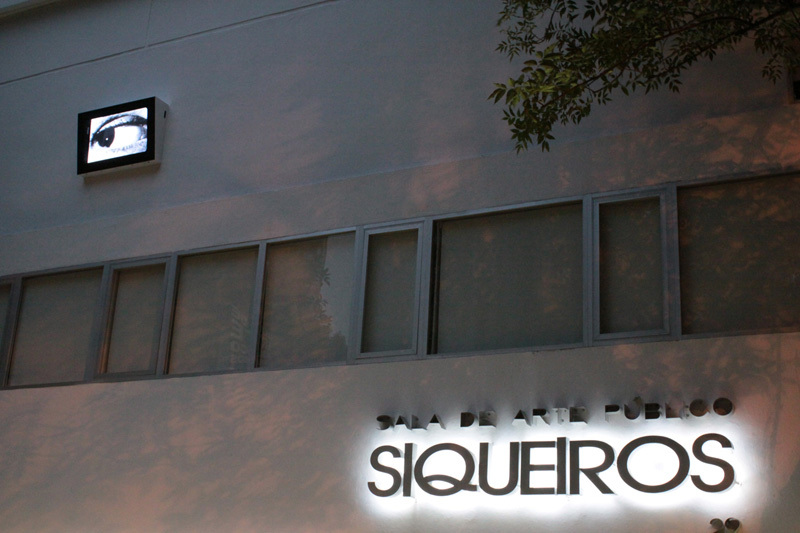 In 2003 he co-founded A Gentil Carioca Gallery, an artist run space in the same city. Born in S�o Paulo, Brazil in 1949, Pedro Agilson attended the Institute of Arts and Architecture at the University of Brasilia (1973). He is the curator of Oi Fuuro’s Virtual Photography Gallery in Rio de Janeiro. Botner and Pedro had a solo exhibition at the Museum of the Republic, Galeria do Lago, Rio de Janeiro (2009) and have been included in several group exhibitions internationally including at Sala de Arte Publico Siqueiros, Mexico City (2011); Centro Carioca de Design, Rio de Janeiro (2010); Institut for Auslandsbeziehungen, Berlin (2010); The 10th Havana Biennial (2009) and the Pyramida Center for Contemporary Art, Haifa (2007). This is Botner and Pedro’s first exhibition at Steve Turner Contemporary.